In this day and age, a slow browser is like a long line at Starbucks; you wait because you need that coffee/information to continue on with your day, but this was supposed to be a quick process. If you’re anything like me, and a large part of your day-to-day work is browser-based; a slow browser is not only infuriating, but counter-productive. Fortunately, there are a few things we can do to speed up how our browsers are running. Some of these are “quick-fixes”, and some of these are more to do with browsing habits. Here are a few little tips you can use for troubleshooting if you’re having “one of those days”. A very common source of poor browser performance is having an excessive number of tabs open. While most modern computers are good enough to handle having ten or more tabs open at once, this will affect performance to some degree. On a slightly older machine, this can be the difference between a smooth experience, and a choppy, awful connection. I recently came across a great article that expands a lot more on this concept, which can be read here. If you’re sitting here currently with 30-odd tabs open, my advice would be to just close a few. You can always find them again by searching your history later! Many moons ago, cache clearing was considered an advanced technique for troubleshooting issues with your browser. As web technology has continued to evolve, developers have utilized the caching of data to improve your experience while using their website. Having data on-hand when needed is great, because it’s much faster to load something directly from your machine rather than to reload it from the internet every time you need it. The bad side to this is that cached data sometimes gets corrupted, and can have an extremely negative effect on your browser’s performance. Considered that pretty much all websites use cached data in some form these days (some much more than others), the chances that your speed issues are related to bad data in your cache are quite high. I consider emptying your cache to be the first port of call if you’re having browser issues. There’s no need to beat your head against your desk trying to work out what the problem is, just clear out your cache and your problem is likely to be fixed. 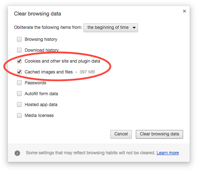 Remember, you don’t have to clear out your passwords, browsing history, or autofill data; just clear out your cookies and cached files and you should be all set! Did you know? Cookies are called cookies because as you make your way around the internet and cookie files are created, you leave behind you a trail of “crumbs” that show where you’ve been. Just like Hansel and Gretel! I love good browsing habits, and cookies.